Welcome to Old School Month on Eternal Central. 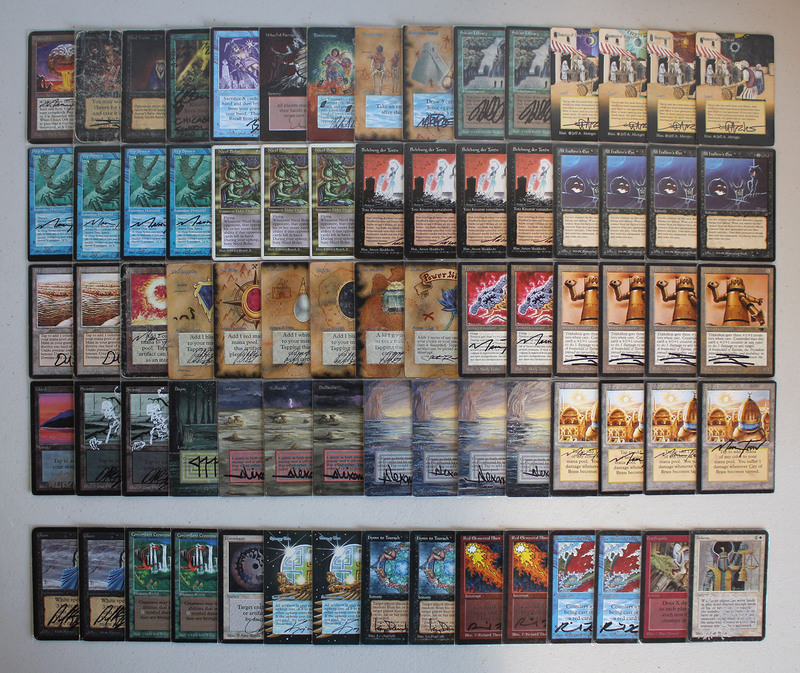 We’re looking at a different Old School 93-94 deck each day of the month. Today’s deck is All-In Reanimator, which puts most of its emphasis on reanimating a large creature with either Animate Dead, or reanimating multiple creatures with All Hallow’s Eve to create a tidal wave of fatties. Here is the latest version I’ve been toying with. 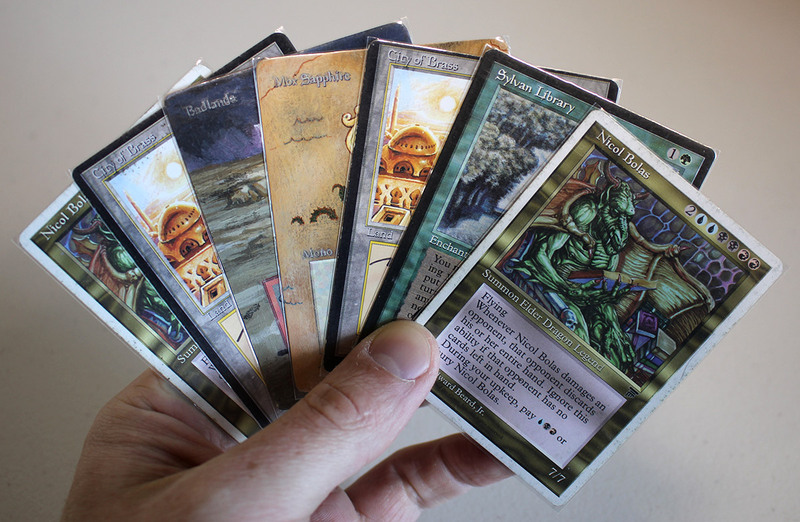 Bazaar of Baghdad is a unique card in Old School Magic, and one that has fueled Reanimator strategies for years. As the card pool gets deeper over the years, and more crazy creatures and reanimation spells are printed, its strength only increases. From Mark Chalice’s ‘The Machine’ (Hell’s Caretaker) deck, to Stephen Menendian’s Alan Comer-inspired 1995 era Reanimator deck, to modern adaptations of Vintage Dredge, Bazaar is the glue that holds together Reanimator decks across eras, enabling necromancers to quickly and consistently dump creatures in the graveyard, while tearing through their deck to find reanimation spells. This build is much different than the JunkShop Reanimator deck we featured earlier in the month. That deck is more of a hybrid strategy that can reanimate creatures, or simply use Mishra’s Workshop to quickly hard-cast large artifact creatures. This article’s Reanimator deck is more focused on reanimating, and especially using All-Hallow’s Eve, and foregoes the Workshop angle. Reanimator decks have historically been seeking to reanimate game-breaking creatures, either with very disruptive abilities, or that are hard to kill. In modern times this has meant reanimating creatures like Griselbrand and Inkwell Leviathan, but in the Old School 93-94 card pool the power level of available creatures is tuned down quite a bit. Nicol Bolas has the ability to wipe out an opponent’s entire hand if it can connect in combat, and thankfully Fallen Empires brought with it a creature that seems custom-made to reanimate: Deep Spawn. While a 6/6 creature is not all that imposing, Deep Spawn has the ability to make itself untargetable until end of turn for just a single blue mana, effectively has some form of evasion with the Trample ability, and also “mills” cards from the top of your deck in to your graveyard during your upkeep (which can fuel further reanimation shenanigans on future turns). 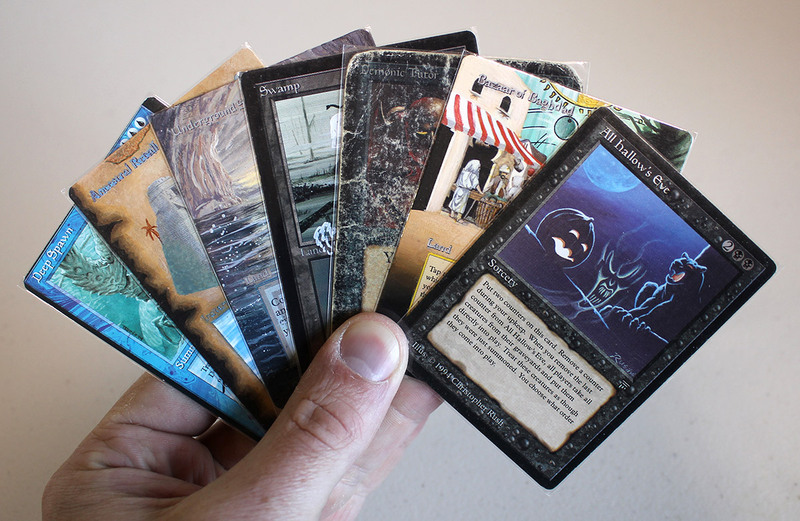 It is the best available creature to reanimate in the Old School 93-94 card pool, and not allowing Fallen Empires for play is one of the significant differences between the Swedish Old School community and much of the rest of the world. 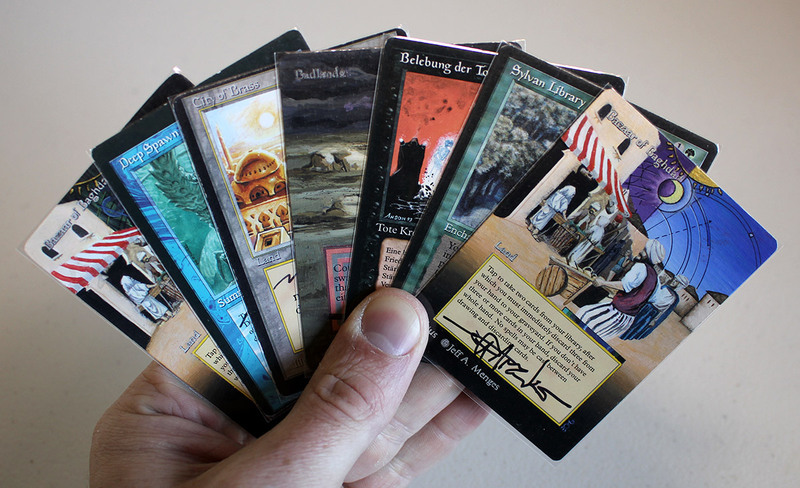 Without access to the set, Swedish community players do not have access to important cards like Deep Spawn, Icatian Javelineers, Order of Leitbur, Order of the Ebon Hand, Goblin Grenade, and more. The direction you want to take your Reanimator deck, and the associated colors, should inform whatever creatures you want to reanimate, or can support. The upkeep mana cost necessary to support the Elder Dragon Legends (such as Nicol Bolas) can hamstring those choices, and that is why the build above is primarily Black-Blue-Red (Grixis) colors. This will not only allow us access to cast cards of those colors reliably, but also to be able to pay the upkeep cost of UBR for Nicol Bolas. Aside from the two aforementioned fatties, I like to subsidize Reanimator decks like this with some amount of colorless and efficient artifact creatures that are large enough that they must be dealt with on their own, but which can also be hard-casted in the event our primary reanimation strategy goes awry. To this end, Triskelion has proven the most fruitful, as it is a sizable threat on its own, while also offering the ability to shoot down opposing creatures and blockers. It also combos very nicely with the reanimation spells to do a significant amount of damage to quickly close out the game. Tetravus is another creature along these same lines, and one that provides different benefits. It can make a small army of flyers to evade Moat (or block opposing flyers), and it if sticks around until your next upkeep essentially renders an opposing Swords to Plowshares or Disenchant irrelevant, as it will have had time to separate in to four smaller threats at the beginning of your upkeep. This deck is primarily Blue-Black-Red, which gives us access to the Restricted List MVP draw spells (Ancestral Recall, Time Walk, Timetwister, and Wheel of Fortune), as well as Braingeyser. I’ve cut Geyser in this version for mana efficiency and space reasons, but a logical argument can be made to include it in favor of Timetwister, in particular. While Timetwister wipes out your graveyard (undoing your work of dumping creatures in the graveyard), it actually works well in this build, and provides a reset button should your expedient reanimation efforts be foiled. Bazaar of Baghdad is the most important draw “spell” in this deck, churning through cards for no mana (other than the cost of the initial land drop), while simultaneously dumping creatures in the graveyard for future use. This version slightly stretches the mana base specifically to accommodate Sylvan Library. Sylvan is especially great in the first couple of turns to help you smooth your mana out, or explode with multiple threats or combo pieces in a single turn, and is bonkers in conjunction with Bazaar. This light green splash also affords us access to Regrowth and Concordant Crossroads, which we’ll touch on a bit more later. 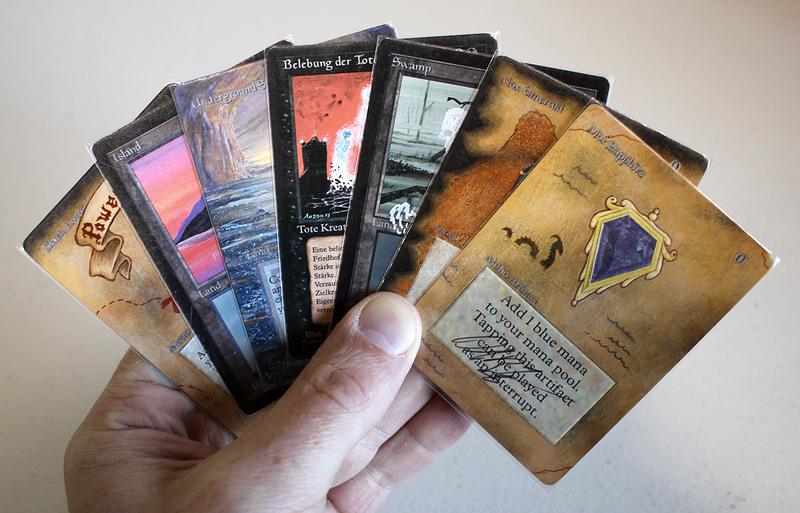 Jalum Tome is another option for filtering your draws and dumping cards in the graveyard, and should be the first logical replacement for Bazaar of Bagdad if you are on a budget Reanimator strategy. It is much slower than Bazaar, but balances that with being card advantage neutral (unlike the card disadvantage of Bazaar). Mind Bomb is another card that sees play occasionally, for its use in discarding unwanted creatures from hand, but I think it’s just worse than all of the cards above. Likewise, Sindbad is another card that’s on color, and has synergy with the rest of the strategy, but is somewhat inefficient for what it does, and makes all of the cheap removal in the opponent’s deck (such as Chain Lightning) more relevant. Still, these are other options to keep in mind if you don’t have or want Bazaar or other pricy cards. The hope when playing this deck is that your creatures are bigger and better than the next deck, so you will theoretically not need much in the way of creature removal. Playing with rainbow lands like City of Brass allow a miniscule splash for Balance, and Earthquake is often a one-sided Wrath of God effect. I like to keep this in the sideboard usually, but there is definitely a good argument to be made for playing the Balance main deck, because you often have very few cards in hand. Old School MVP Chaos Orb is of course present as a colorless way to deal with any nagging permanent or threat. The way this build is configured is to just be the aggressor in most cases, and skip out on stuff like Disenchant for the most part. 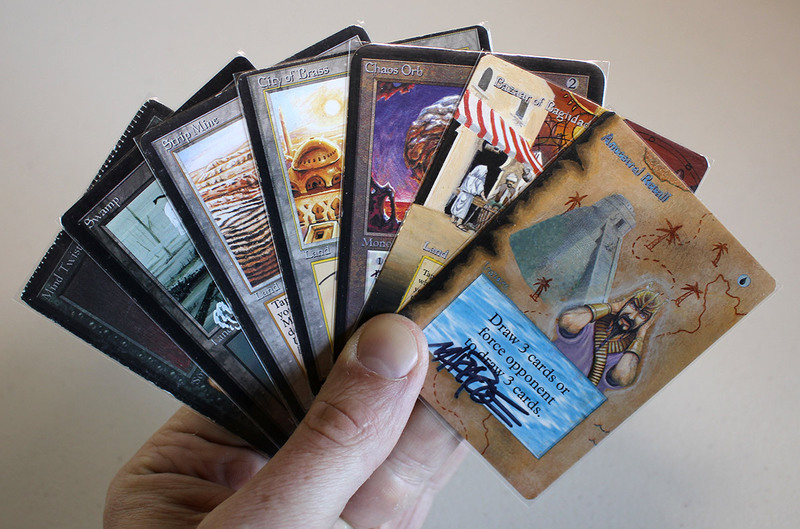 I like access to 1-2 copies in the 75, as it is very effective at dealing with problematic permanents that the opponent may have as a trump to your strategy. Black and blue are the most important colors in this build, for casting your reanimation spells, as well as holding up blue mana to pay to protect Deep Spawn from spot removal. After that, red is somewhat important as a means of simply paying for the upkeep cost of Nicol Bolas. Everything beyond this dual land configuration is a luxury, and City of Brass is the best at making the aforementioned light color splashes a reality. I like 1-2 Strip Mines as an answer to Library of Alexandria, Maze of Ith, and Island of Wak-Wak. Mishra’s Workshop is another card that can be considered for its ease of powering out your artifact creature threats, but I wouldn’t want more than 1-2 in this specific deck, because the colored mana requirements are so heavy for our other threats and spells. This deck wants access to tons of fast mana, so all of the SoLoMoxen are present, to help power out faster reanimation spells, and to accelerate in to hard casting fatties when need be. The sideboard for this is pretty open, and how you build your mana base will determine what you have reasonable access to. 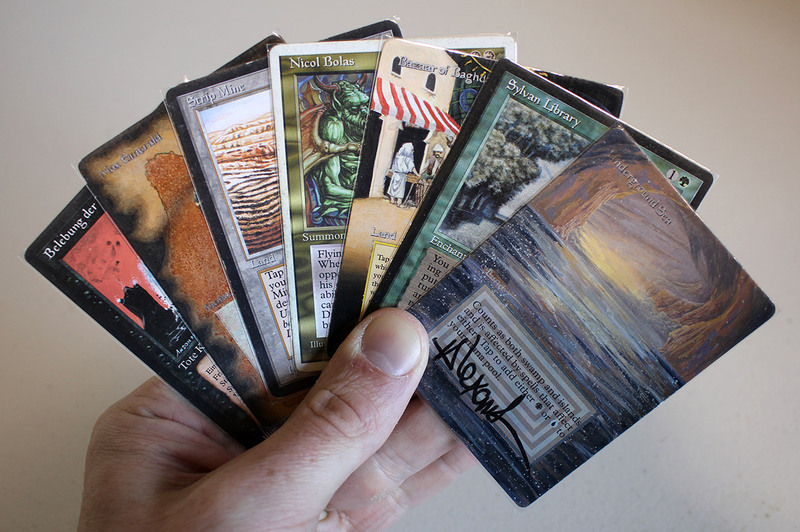 Most of the sideboard cards are one-ofs, or two-ofs, to address a variety of hate cards you’re likely to see. Flash Counter is very useful for dealing with not only opposing countermagic, but also instant speed removal spells like Disenchant and Shatter. It’s not in the deck pictured above, but I’ve played it both main deck and in the sideboard of Reanimator before, and it is a worthy consideration. Similarly, Avoid Fate is very good at protecting your permanents, for only a single mana investment. Red Elemental Blast a very efficient way to win counterwars or kill a fast Serendib Efreet, while Blue Elemental Blast is used against very aggressive burn decks, and is especially helpful against Blood Moon. Energy Flux can run afoul of some of your own artifact threats, but is so potentially devastating against very heavy artifact threats that this may often be worth it. Trading one-for-one against these decks will rarely get you ahead, so Flux or Shatterstorm are often better options. Gloom is a nice tool against the deck that will heavily rely on tons of white removal spells to beat you. The less acceleration they have, the better Gloom is, but if they have tons of artifact acceleration to play through Gloom, it’s better to leave in the sideboard in favor of something like Hymn to Tourach, which can proactively strip away countermagic and spot removal. Hymn is a fine candidate for main deck play as well, to combat these same nuisances. Concordant Crossroads is a candidate for the main deck in many Reanimator strategies, and being that it’s an Enchant World, it also acts as a removal spell against The Abyss should you play it second (the most recently cast/resolved Enchant World kills all others in play). I prefer it in the sideboard of this version, but it pairs especially well with Nicol Bolas. The most common play pattern for this deck will be to find a discard outlet (such as Bazaar of Bagdad, Recall, or Wheel of Fortune), and then use it to dump one or more large creatures in to the graveyard. It then proceeds to use Animate Dead and/or All Hallow’s Eve to bring back said creatures. This was the precursor to the mechanic now known as Suspend, and this gives you time to dig for more creatures after it has been cast. 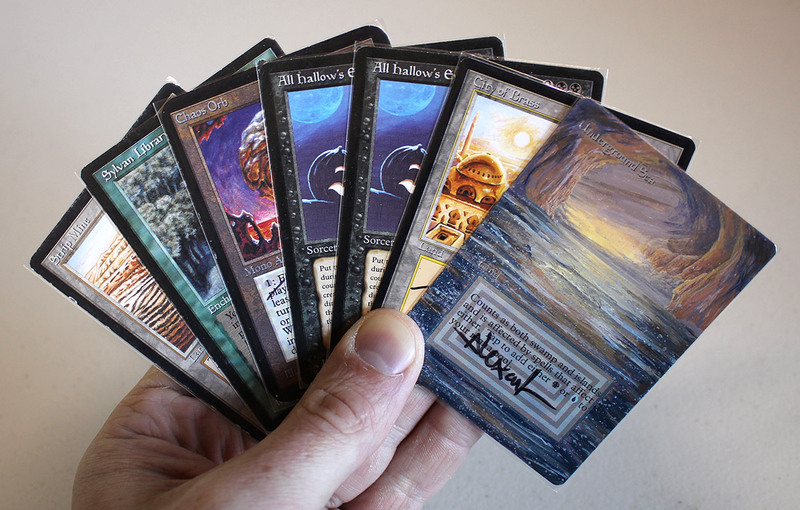 A common line of play will be to resolve All Hallow’s Eve, and then to activate Bazaar of Bagdad three times before the All Hallow’s Eve effect takes place (tapping Bazaar once on the turn Eve is cast, once on the next turn, and finally again on the next upkeep before the last scream counter is removed). This often leads to a few creatures getting reanimated simultaneously, and if your opponent is already at a low enough life total, reanimating 2-3 copies of Triskelion will often be enough to finish them off even without an additional combat step. Everything else in the main deck is basically crafted around this plan, whether it be draw spells, library manipulation, or mana. All of these things work to ensure you find a discard outlet, creatures, and reanimation spells. Another thing to consider if playing a build with a heavier white component is the card Resurrection which is a 4 mana reanimation spell with basically no drawbacks. It is slower, but a powerful card to consider. This is a solid opening hand, with Bazaar, a fatty creature, a reanimation spell, and enough mana to operate. It even has a backup Bazaar in the event the first one gets Strip Mined, or it can be discarded to the first Bazaar activation (along with Deep Spawn and one of the freshly drawn cards). Another hand with Bazaar, mana, a threat, and gasoline. Between the Ancestral and Demonic Tutor, we’ll likely find enough mana to cast the All Hallow’s Eve quickly (or an Animate Dead), so this hand has everything we need, and is a snap keep. With a Bazaar, plenty of mana and acceleration, and a creature to reanimate, this hand is a keeper. We don’t yet have a reanimation spell, but between natural draws from the top of the deck and Bazaar activations, we’re fairly likely to find one. There is also the possibility of playing this hand slowly, only playing the Bazaar when we have at least two cards we don’t mind ditching from the hand (including the Nicol Bolas). 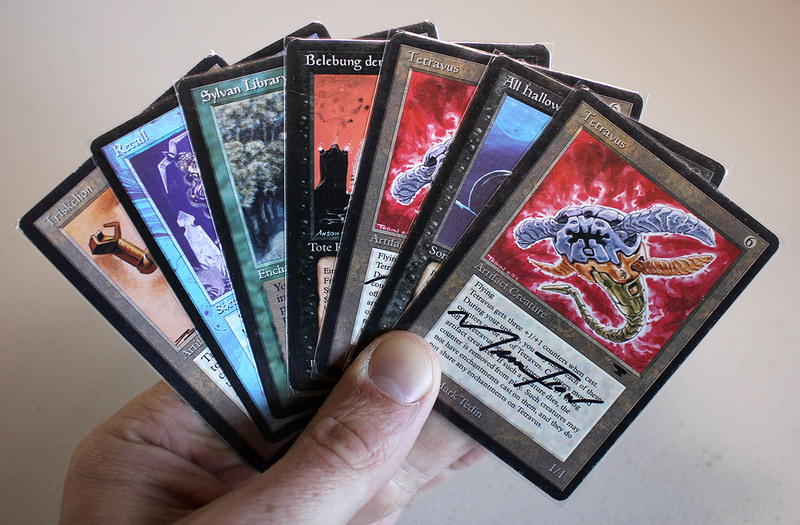 This hand has plenty of acceleration, mana, a threat, Demonic Tutor, and a massive bomb in Timetwister. Depending on what is drawn on the first turn or two, I’d likely lead with Demonic for Ancestral Recall, and then try to cast that or Triskelion on turn two, and then refuel with Timetwister a couple of turns down the road. A lot will depend on natural draws the first couple of turns, and what you’re playing against. Ancestral, Bazaar, Chaos Orb, and Mind Twist, along with the mana to cast them, make this a pretty easy keep. Without mana or a Bazaar, this hand does nothing, and is dead in the water. Let’s mulligan and hope for a better six. Plenty of mana, Time Walk, and a couple of threats. While this hand lacks a discard outlet, it’s probably better than a mulligan to five. 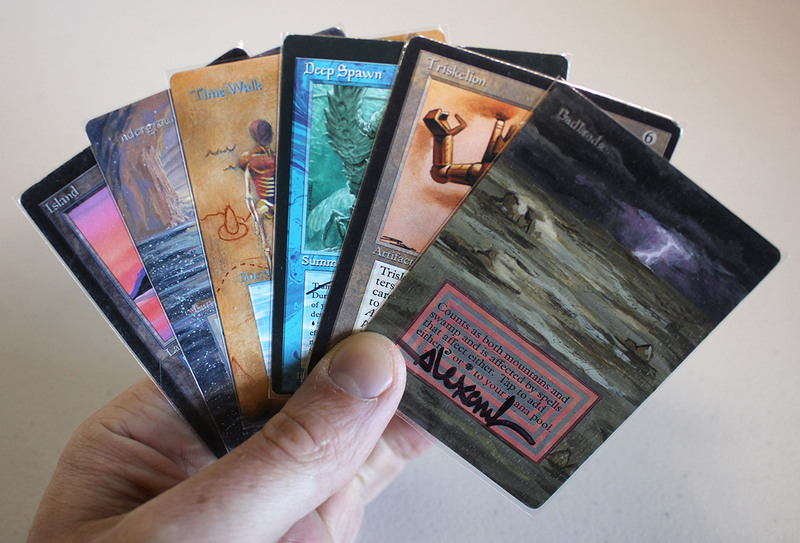 With the pre-game scry I’d be looking for a draw spell or a Bazaar, and probably ship anything else to the bottom. 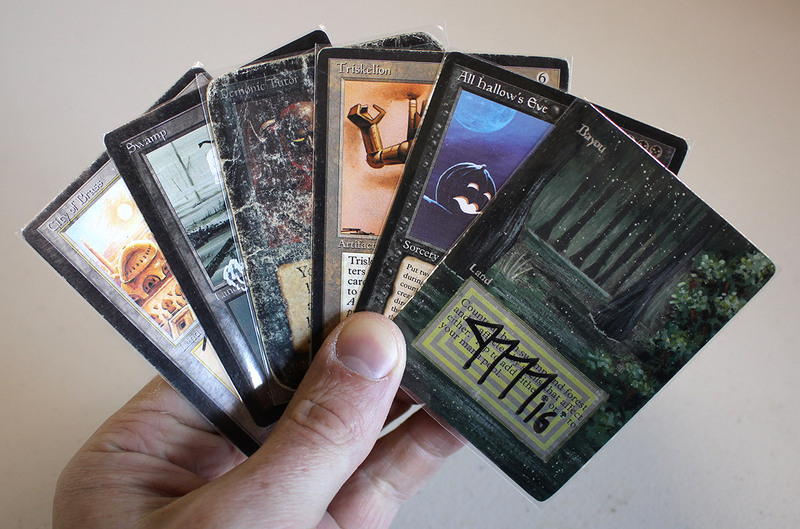 This has all the makings of a successful hand. We have Bazaar, mana, a draw spell, a reanimation spell, and a creature to reanimate. I’d lead with Emerald and Strip Mine in to Sylvan Library on the first turn. You’re not going to want to reanimate on the second turn anyway necessarily (as we don’t yet have the mana to pay for Nicol Bolas’ upkeep, nor do we have the mana to hold up blue mana to shield Deep Spawn should we find that to Animate Dead). We’re counting on Sylvan and Bazaar and our natural draws to optimize this, but it’s already quite potent. There is no draw or discard spell in this hand, but there is so much fast mana that we can realistically just hard-cast any large creature we draw. I’d understand mulliganing this hand for more action, but I’d probably just keep it, because the ability to quickly cast anything in the deck is always strong. With mana, Chaos Orb, Sylvan, and a couple of reanimation spells, this hand looks like a mediocre but probable keep. 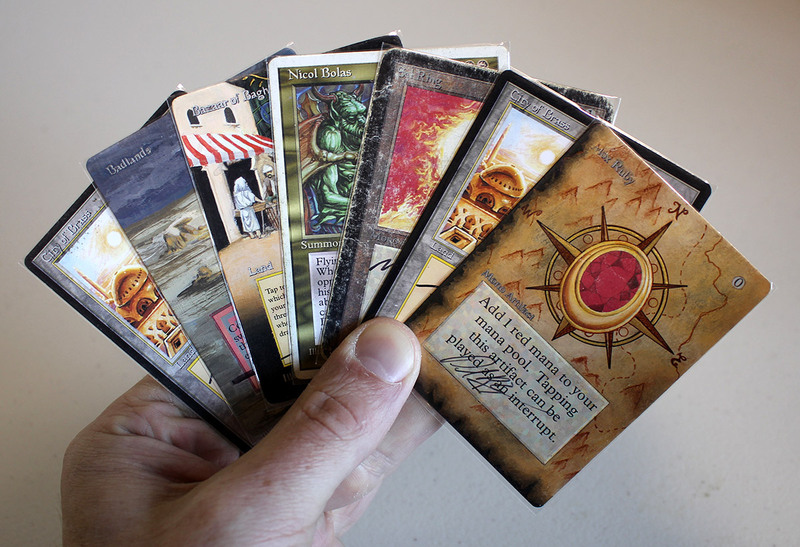 Somewhat similar to the previous hand, this hand does contain mana and Sylvan Library, but little else to buy time. I’m going to flush this for a fresh six. For a mulligan to six, this is a keepable hand. We have mana, a reanimation spell, a threat, and a Demonic Tutor. 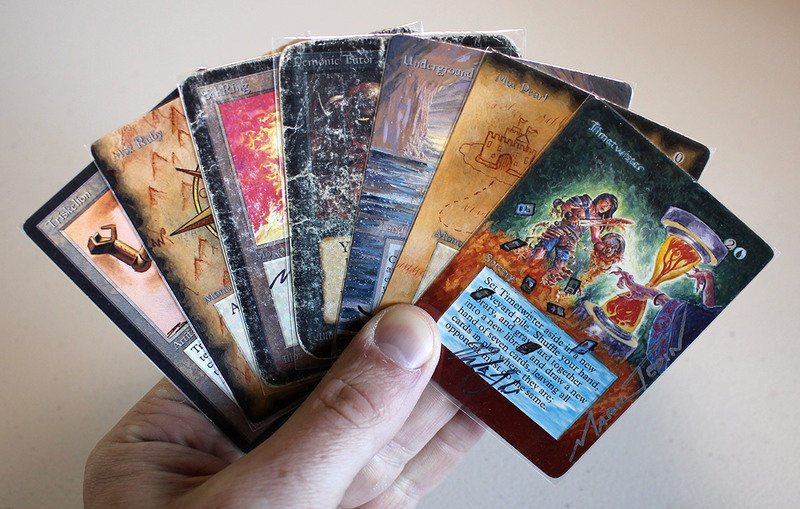 Depending on what is drawn in the first couple of turns, you’ll probably want Demonic to either grab Ancestral Recall, Wheel of Fortune, or Bazaar of Bagdad. With the pre-game scry we’re searching for either fast mana, Bazaar of Bagdad, or any powerful draw spell. Reanimator is a surprisingly flexible shell for reanimating sweet creatures that you’re unlikely to see in other decks. Black has the best and most reanimation spells, but white is not to be overlooked, for access to Resurrection. Think about the creatures you can afford to reanimate (or hard cast) when designing your deck (and mana base), and also the additional utility of cards like Eureka, and how they could potentially interact with large creatures stuck in hand. This deck translates OK to a budget strategy, but without Bazaars you’d obviously lack the explosiveness of a deck like this.